Only a few yards from our vehicle, a single-cylinder water pump alternately chugs and sputters, drawing water from beneath the sand and sending spurts through a pipe to a square trough. This artificial waterhole keeps the bachelor elephants close by, waiting for spring rains and the return of female breeding herds. The steady sound of the pump, chug-sputter, chug-sputter, chug-sputter lull my eyes closed. They open, close, open half-lidded, close again. I focus on his great head, nodding downward with each step, as he trudges past. A thirsty pilgrim in a parched land, his trek to water is nearly finished. He’s headed straight to the trough; the clicking and whirring of our cameras doesn’t alter his gait. His enormous tusk splays out sideways. It’s easily four feet long, stained and chipped on the end. 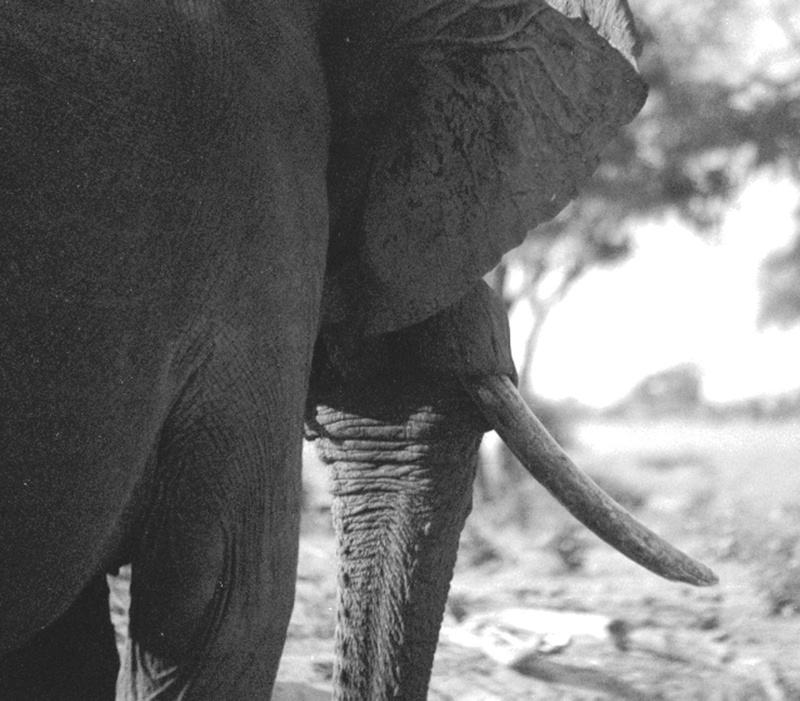 It grows out, rather than down and up – his tusks made him a much wider elephant than he really is. Mid-drink, he curls his trunk into his mouth; head tilted back, eyes closed. He makes gargling sounds as he drinks. Extending his trunk down into the water, he blows bubbles. Then he curls his trunk again and again to hose several gallons at a time down his throat. Each swallow contains the taste of dung, samplings from all the animals that used this waterhole – zebra, wildebeest, warthog, ostrich, hyena and the occasional furtive flavor of lion. I try to imagine the bouquet garni of the water and how its myriad fragrances might seep into the crevices of an elephant’s mind, form pools of scent they recognize, year after year, the liquid memory of Africa. Perhaps this old bull is memorizing the stories in that trough, paragraphs of taste and smell, twists of plot and character and fate. Finished drinking, he turns around and heads back to where our vehicle is parked, stopping just twenty feet away. His skin is the color of seasoned cast iron. The waterline on his body rises just past his belly. Spatters of mud stain his ears and back. After several long minutes, his eyelids droop and his mouth slackens. Under the hot sun he falls asleep, lulled perhaps by the narcotic of a long, slow drink. The tip of his trunk coils like a magic rope on the ground. He sleeps with his weight on three legs, resting a hind leg, occasionally rocking back on it as if he’s dreaming of his trek. 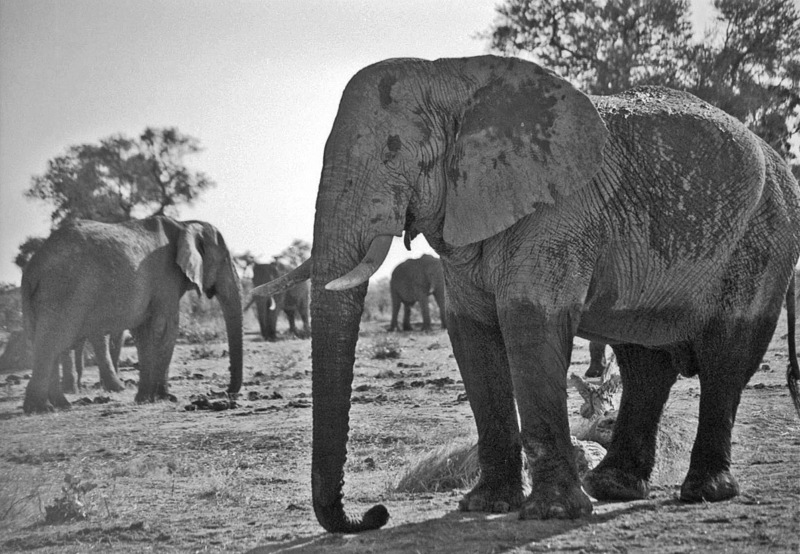 Drool from the end of his trunk slowly seeps into the sand. The giant beside us rumbles soft snores in his sleep. I wonder if he is aware of the humans next to him, nodding their heads, also falling asleep. Other bachelors shuffle by quietly on their way to and from the waterhole, as if they don’t want to wake us. Tiny paws of wind skitter across my arms; keep me half-awake. But for one long moment, I almost entered his dreams. I sink knee deep into the poetry of your words (the gentle sway – much like the bull elephant sleeping) and imagine I am there. Thank you. Entering the dreams of the bull elephant – lovely… He certainly entered your drowsy half-dreams :-). Thanks for reading and tweeting! Amazing! You bring me right along with you! Great shots! They house the big cats, bears, elephants, primates, and others…Stay tuned for photos of the animals that these folks help! Sounds like a fun weekend. PAWS does great work and has taken in many zoo elephants that needed help. Take lots of photos for us who’ll never make it there!